Red Carpet again. Well I guess with the Oscars right around the corner it seems fitting. And Purple. Hmmmm. Guess I’ll have to pull out my purple stash that I don’t even know if I have. Purple is not a color I collect too often. But I do believe I have some; an orchid color silk velvet and vintage pale lavender beaded silk; a deep lavender silk charmeuse I could use with a black lace. I immediately think of Dior’s Spring 2010 RTW collection with the lingerie inspirations. February 23, 2009 On with the Design! 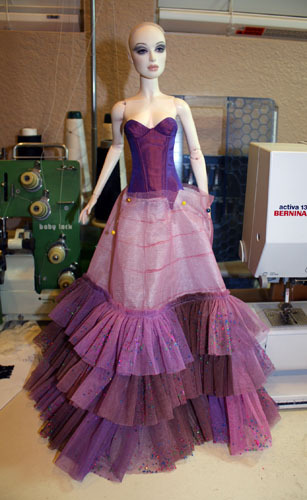 I start fitting a bodice to a Syb but there is Psyche (Numina Grey) looking at me-“When are you going to do my gown? You know the crossdye orange and ombre mesh?” Yes I know. I’m dying to use this fabric but it is not purple. But, the fabric shop did have it in a purple tone, didn’t they? If I remember correctly. I’m going to have to check that out. I ran down to the fabric shop after work today and picked up the purple ombre mesh. It has a lot more brown in it than I remembered but I still think it will be pretty. Now to find a coordinating fabric for the bodice. While I was going through my fabric bolts I ended up finding (buried under some other taffetas) a bright purple crossdye that blends in great with the mesh. I forgot I had this one! 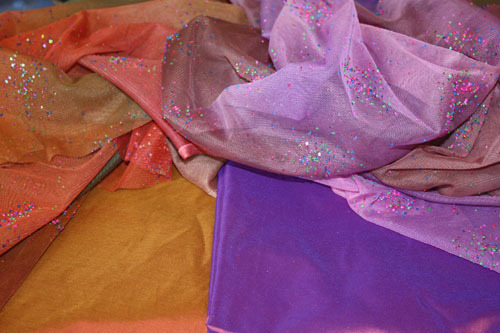 Now I will be able to do sister gowns: one in purple and a similar style in the oranges. 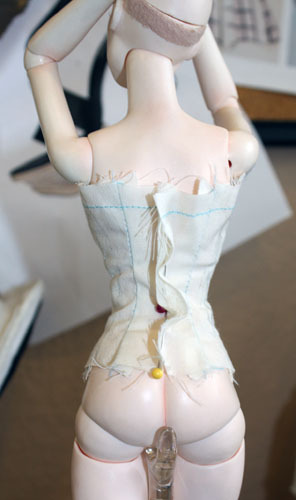 I started fitting a bodice to Psyche. 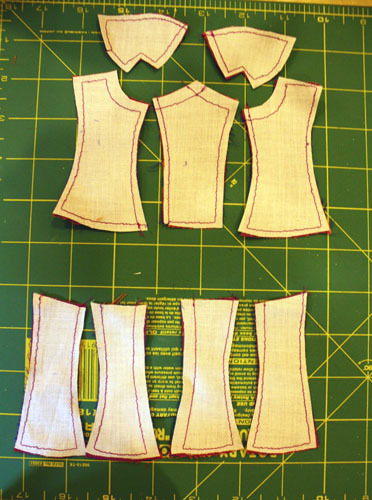 For this I am going to use an existing corset pattern I drafted a few years ago on the Tyler bustform. I sewed up the corset in muslin and tried it on Psyche. It’s a little big in the chest but the waist length is good. I’m going to pin in where it is big and mark it it on the muslin. I also want to change the front seamline a bit, so I am going to mark that as well. Muslin toile on Psyche, adjustments marked. 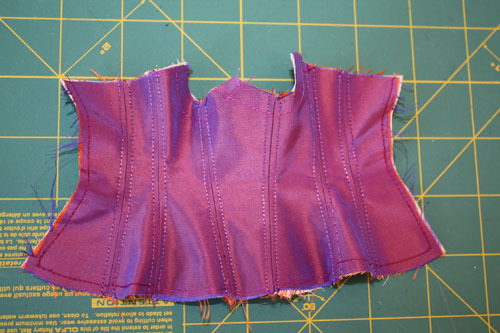 Now I am going to cut along my marks, and take apart the corset where there are seams along the marks as well as cut away the seam allowances. When I cut a pattern, I always make a couple copies (I have a 4-in-1 copier at home, makes it very convenient for pattern making). 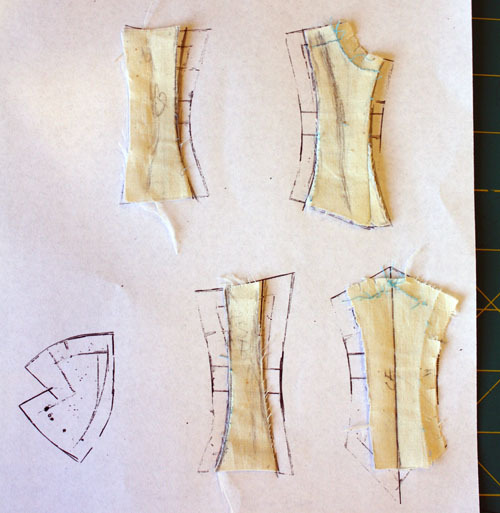 Placing the cut muslin pieces on top of their corresponding paper patterns, you’ll see where to draw new lines. From here I true up the seams and and seam allowance. 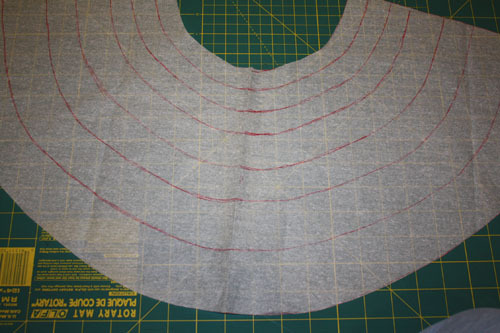 I’m also changing the bottom line from a V to a curved drop waist. From here I would usually make another toile to check fit on the revised pattern, but I have enough fabric to do another if it doesn’t work. 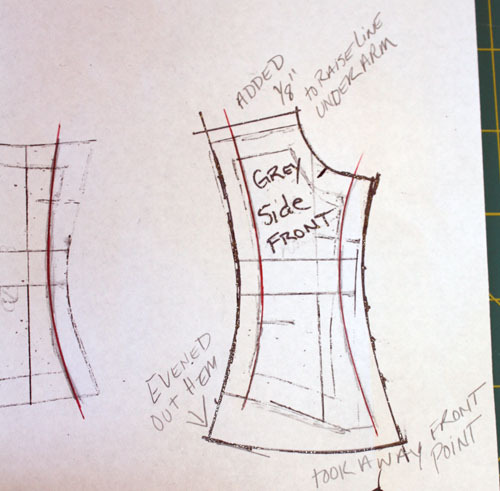 Besides,(and I know this sounds a little conceited) but I am pretty confident in my pattern making skills that the fit will be pretty near perfect. So here it goes…. I’m underlining the pieces in a stiff cotton underlining instead of the usual woven fusible I use. Here the seams are stitched and pressed open; topstitching is going to be applied for decorative purposes and to hold the boning. 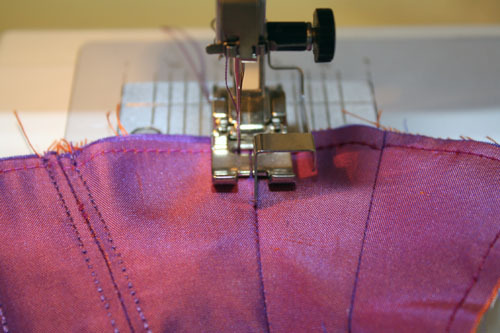 I’m using a Sulky rayon embroidery thread and an edge stitch foot to get a precise top stitch. I set the needle position to 1/8″ away from the seam and the edge stitch foot fits neatly into the seam. See how great the topstitching is? 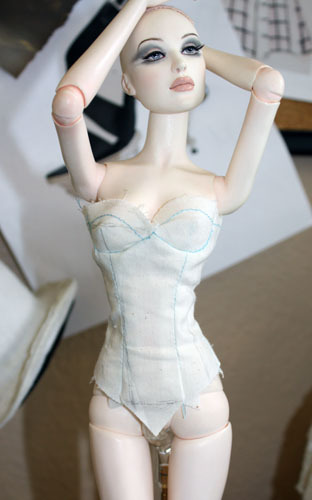 From here, boning will be inserted after the bra cups are sewn in. 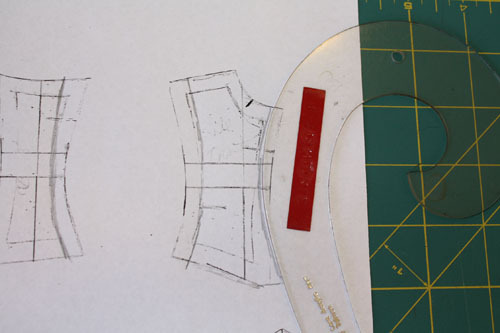 Bra sewn in-boning inserted and checking fit. I couldn’t be happier with how it’s turning out. 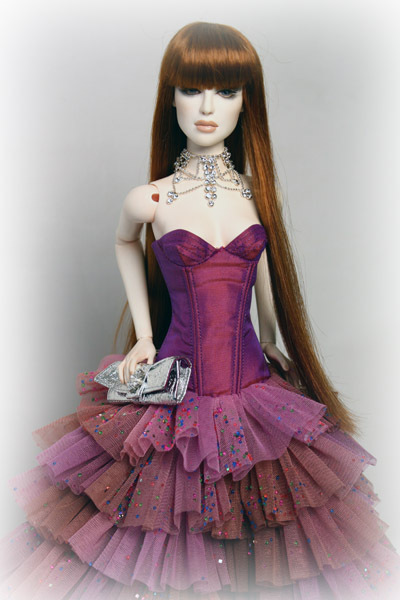 Psyche is too- she can’t wait to strut her stuff on the runway. checking the fit before lining is sewn in. Tonight I sewed in the lining. I’m dying to get the skirt started though. Drafting out a skirt on tissue, I’ll use this as a guide and stabilizer to sew the ruffles on. I want this skirt to be flowing- not stiff so I found some mauve tulle that will work well for the underskirt the ruffles are sewn to. 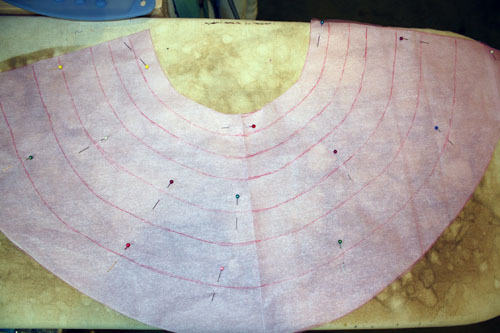 Plus I’ll be able to see the guide lines rather than having to draw them onto taffeta. First row of ruffles- I’m using a 5:1 ratio for the ruffles and am starting at the bottom. I managed to get two rows sewn on tonight. I finished sewing all the ruffles this weekend. 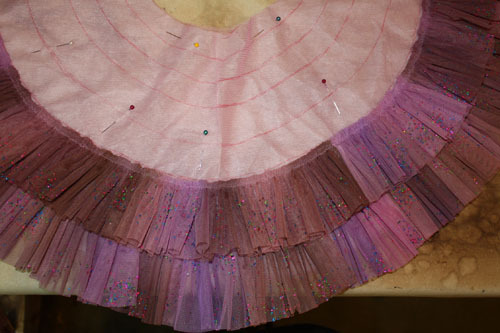 Seven rows of tulle confection. I have already attached it to the corset and decided to have the corset lace up the back. It has turned out gorgeous and Psyche is thrilled. Now it’s onto the accessories. The accessories I decided to make were a silver faux leather clutch and matching crystal heeled sandals-in which shoe making needs to be a another tutorial. 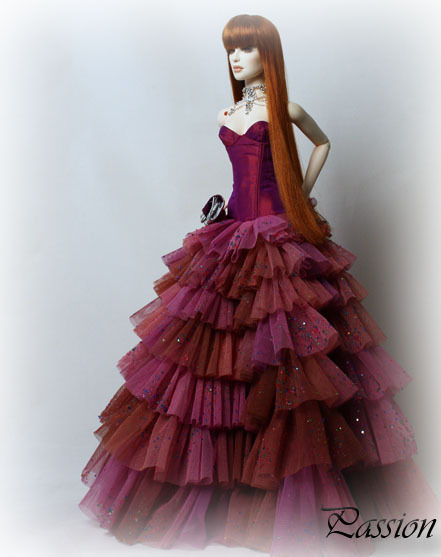 So here is the final gown-Passion. Psyche looks so great.